This event's performance date has changed (the old date was Saturday, 16 Feb 2019 at 7:00 PM). The show will now take place on Friday, 28 Jun 2019 at 7:00 PM. 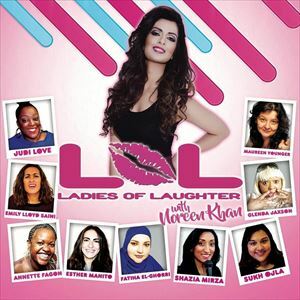 LOL (Ladies Of Laughter) with Noreen Khan comes to Watermans Arts Centre Brentford! Join Noreen Khan (BBC Asian Network) as she hosts a night of comedy with some of the UK’s favourite female acts. Note: All acts are confirmed at time of booking. Occassionally acts may be replaced for reasons beyond our control. If this happens the act will be replaced with another act from the tour or a suitable alternative. The ticket purchased is for LOL (Ladies Of Laughter) With Noreen Khan & not an individual act – refunds will not be offered for act changes.